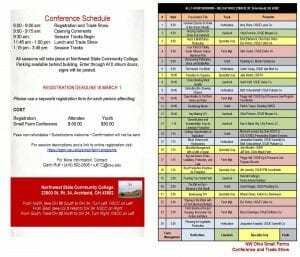 The 2019 NW Ohio Seeds For Success Small Farm Conference will be held on Saturday, March 16 at Northwest State Community College, located at 22600 State Route 34, Archbold Ohio. The conference provides education and topics of interest for small farm and rural landowners. Participants will walk away from the conference with knowledge and ideas of how to improve existing enterprises or marketing opportunities. For those who have some acreage but don’t yet know what to do with it, the conference is an opportunity to consider possibilities, gather information and make contacts. 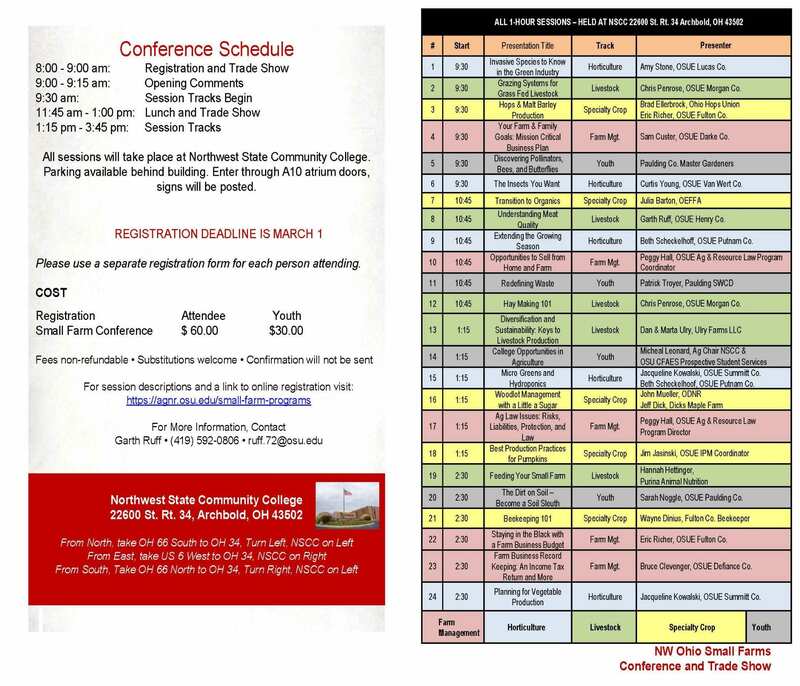 The 2019 NW Ohio Seeds For Success Small Farm Conference offers 24 different breakout sessions divided between five different track topics; Horticulture, Livestock, Farm Management, Specialty Crops and Youth. Presenters include OSU Extension specialists, Extension Educators, Business owners, and small farm producers/entrepreneurs. Conference participants will have the opportunity to attend four different sessions over the course of the four breakout sessions. The Small Farm conference trade show offers another opportunity to learn and gather information. The trade show vendors/exhibitors feature goods and services used in small farm operations. The conference schedule includes time between each breakout session and over an extended noon hour to visit the trade show. The horticulture track offers sessions on growing vegetables, microgreens, extending the growing season, managing pests and invasives. The livestock track includes sessions on raising and marketing pasture produced beef and poultry, as well as hay production, livestock nutrition, meat quality, and sustainable livestock production. The specialty crop track features sessions on malting barley and hop production to tap into the growing microbrewery businesses. One session pumpkin production, while others focus on beekeeping and woodlot management with some maple production mixed in. The farm management track includes Ag law, business planning, tax issues, farmland renting, and creating profitable small farm enterprises. The youth track includes sessions on pollinators, managing wastes, soil science, and college opportunities in agriculture, featuring Northwest State Community College and the College of Food, Agricultural, and Environmental Sciences at the Ohio State University. Conference registration/sign-in and the trade show opens at 8:00 am on March 16. Following some brief conference opening comments at 9:00 am, the first breakout session begins at 9:30 am. The conference concludes by 4:00 pm. Conference registration is $60/person. Youth discounts are $30 for those under the age of 18 interested in attending the small farm conference. Pre-registration for both the Small Farm conference is due March 1. On-line registration is available at http://www.cvent.com/d/16qnb9. 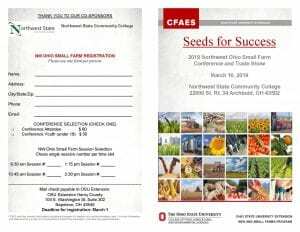 A Seeds For Success Small Farms Conference brochure that lists session topics and presentation times along with a mail-in registration form, and a document with descriptions of all the presentation topics is available at https://agnr.osu.edu/small-farm-programs. 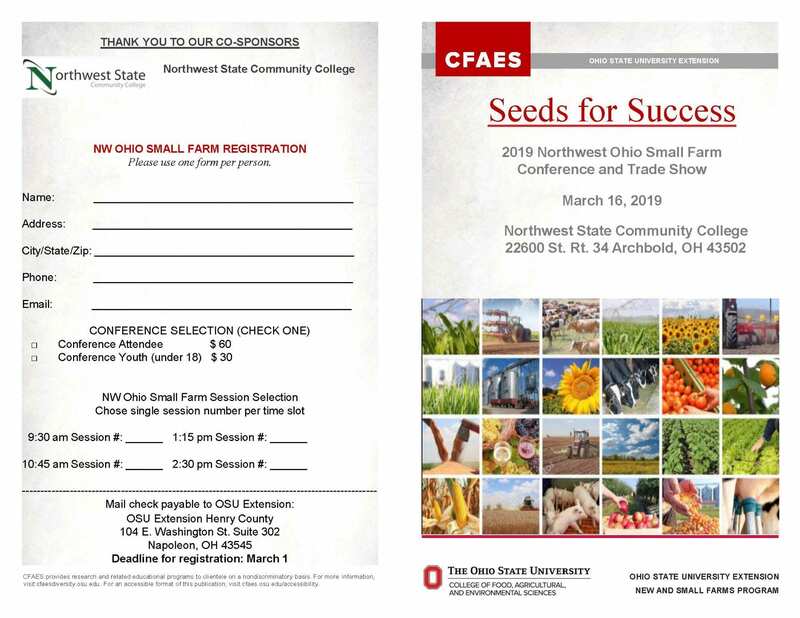 For more information about the Seeds For Success Small Farm Conference contact Garth Ruff in the Henry County Extension office at 419-592-0806, email: ruff.72@osu.edu. Posted by ruff.72 at 10:41am Posted in Farm Management and tagged Farm Management, Horticulture, Livestock, Youth. Bookmark the permalink.